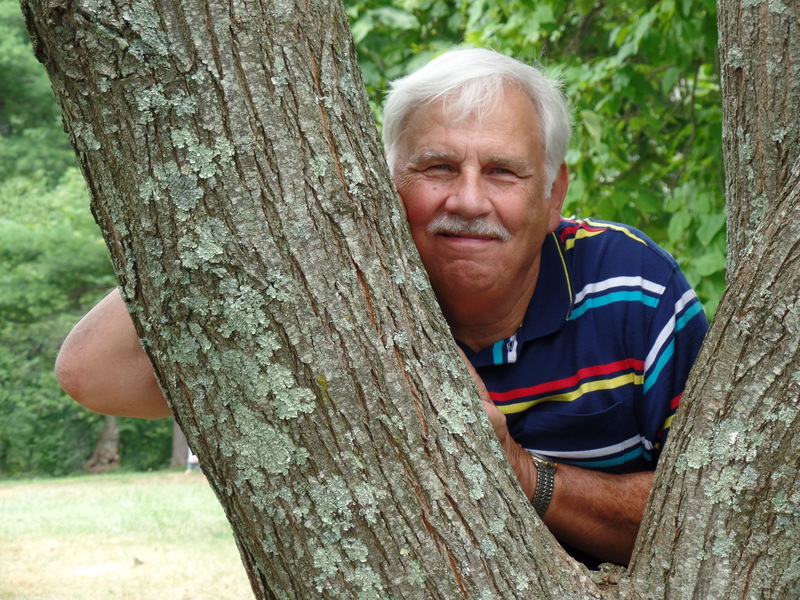 Michie’s Tavern – Let's Go RVing! I woke up early, about 6:30 and could smell the coffee so I got on up and enjoyed the quiet time. Jerry slept late for him so I was afraid he’d either had a bad night or a headache. Fortunately he had neither. Because he drank a lot of tea last night since he had a lot of pepper with his dinner he was up and down all night going to the bathroom. In between he slept well though. We got showered and dressed and packed our little bad of goodies for the day. Jerry had put a couple of bottles of water in the freezer last night hoping to use them in the cooler today to keep our drinks cool. We packed the cooler with water, gator aid and lemonade plus added some nabs and chips. Honestly we felt that would be enough for the day. We decided that if we found that we were hungry today we’d pack sandwiches for tomorrow. We probably will! 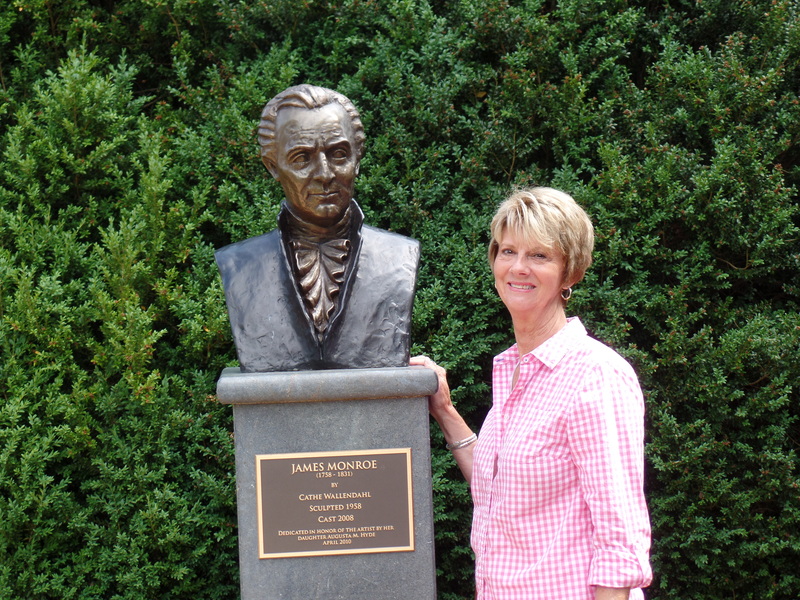 Our first excursion was to Ash-Lawn Highland, home of President James Monroe. It was a simple house with lovely grounds. The tour guide was very informative and able to answer all questions presented to him. The lady working in the gift shop was very nice and we even talked about her visit to Oak Island, home of the best seafood! We had a picture taken in front of a tree that was at least 250 years old and it was huge. I can’t imagine how many people it would take to encircle it. Very definitely the biggest tree I’ve ever seen! The mountain views were so pretty except for the towers that really took away from the beauty. 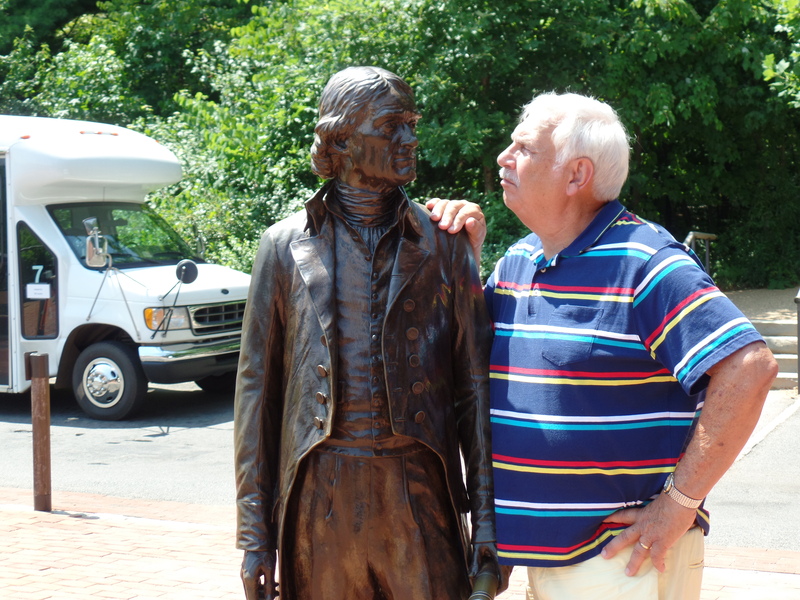 Next we headed to Monticello, home of President Thomas Jefferson. It was quite a contrast to the home of Monroe, nothing simple about that place. It was a home of change apparently as Jefferson would change his plans whenever he saw something he wanted to add. It is very palatial as are the grounds. We wandered around there for a couple of hours. There were also some huge trees there and interestingly enough they had large branches sprouting in different directions. Some of them looked like they’d been tied in a knot. Jefferson wanted to be remembered for three things: the Declaration of Independence, author of the Virginia religious freedom and the founder of the University of Virginia. Afterward we trekked back to the car and thankfully Jerry knew where it was. We ate our chips and drank our drinks and decided for sure to have sandwiches on Monday! The next spot to visit was Michie’s Tavern. We didn’t want to eat but we did visit the shops. The General Store had a lot of interesting doodads and also a beer and wine tasting. The lady in charge of that was very informative and suggested some other places we might want to visit. Most of them were wineries though and as Jerry doesn’t drink and I drink only a little and moscato at that we probably won’t visit many of them. She said moscato hadn’t made it to Virginia yet! As we were done with the tours of the day we decided to visit nearby Carter Mountain Orchard. It is at the top of a very high mountain. Glad we weren’t in the motor home and I suggested Jerry not run off the road as it was a sheer drop-off – wow! They had several different kinds of apples and peaches plus a general store with pretty expensive jellies, etc. We went in the wine shop and I tasted two of the wines, one with peach flavoring and one with chocolate flavoring. I’d rather eat the peach and/or chocolate! We did buy four apples which looked like the good old green sour apples from home. They were a little tart but that’s all. Our next trip was to the Barboursville Winery. Barboursville is only about 16 miles from Charlottesville but it’s a pretty long winding road, pretty scenery though. On the way there Gypsy took us right through Charlottesville. The sign pointed toward Historic Charlottesville. Yeah – it was historic all right – not exactly the sites on the tourist trail. We made it to the winery and instead of a tour they just had a tasting which neither of us wanted and only wine things for sale in the shop. 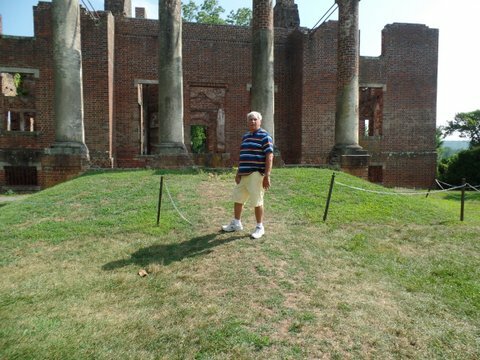 We only stayed a few minutes and then went to the Barboursville ruins just down the road. It’s a ruin indeed. The house burned on Christmas Day about 100 years ago and it has just continued to “ruin” since then. Being the only car in the parking lot should have been a dead give away. There is a chain around the house so all one can do is walk around three sides of the house. Oh well. Decided it was time to call it a day so we came back to the motor home and immediately started in on dinner. I fixed stewed potatoes and peas and we heated up the pork chops. Tomorrow we’ll finish the veggies! I had hoped for a walk but it began to sprinkle so I spent most of the evening talking to Mary Ann. Bed about 10! Ready for Day Three! We love taking pictures in the trees!